Jewellery has been iconic throughout history, with diamonds adorning the heads of ancient royals, rubies gracing the hands of film stars and gold glistening on the arms of the glitterati. But these pieces don’t come without a price tag. There are a number of factors that determine how much a piece of jewellery costs, including its rarity, the quality of the metal or gemstones, a pieces provenance and even the demand an item dictates on the second-hand market. 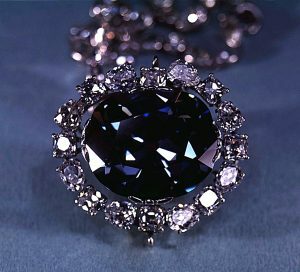 It would be a crime to list the most iconic pieces of jewellery without mentioning the world-renowned Hope Diamond. One of the most well-known pieces in the world, the deep-blue diamond weighs 45.52 carats and admits an unusually intense and strongly coloured red luminescence. It’s estimated to be worth $200 – $250 million. The jewel, which is believed to have originated in India, was sold to King Louis XIV of France in 1668 and then stolen in 1791. It went throughout various owners, including socialite Evalyn Walsh McLean, until it was bought at auction by diamond merchant Harry Winston in 1949 who then donated it to Washington’s National Museum of Natural History where it remains to this day. Thanks to its unusual red glow and extravagant history, the Hope Diamond has been plagued with rumours of a curse for years. The mythology surrounding the diamond claims that misfortune and tragedy will befall anyone who owns or wears the diamond, with the fate of King Louis XIV being used as an example. Now, this curse is largely believed to be a fabrication devised by salesmen to increase the value and popularity of the gem, but it’s mysterious beauty still fascinates people all over the world today. 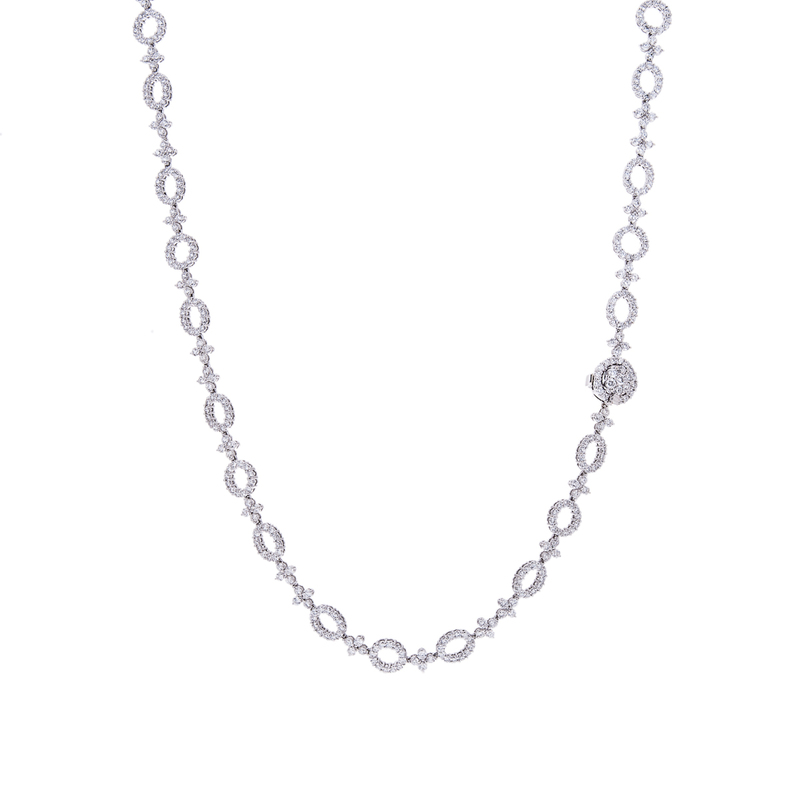 If you have been enchanted by the beauty of the Hope Diamond but don’t want any of the bad luck that accompanies it, take a look at our exquisite range of diamond necklaces that can add that Hope opulence to your jewellery collection. With a name like “L’Incomparable”, this piece of jewellery was always going to be quite exceptional. This necklace was created by Lebanese jeweller Mouaward and features the world’s largest internally flawless diamond of more than 407 carats surrounded by a further 91 white diamonds on a rose gold chain. Valued as the most expensive necklace in the world, the beautiful centrepiece diamond was found by chance in a discarded pile of rubble by a young girl in the Democratic Republic of the Congo about 30 years ago. Take a look at our yellow diamond collection to pay homage to the L’Incomparable Necklace and add a similar your piece to your collections. 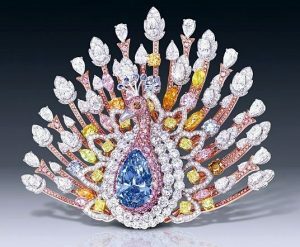 Revealed at the TEFAF exhibition in Maastricht in 2013, the Graff Diamonds Peacock brooch is probably the most valuable brooch in existence. The draw of the piece is a pear-shaped 20.02-carat deep blue diamond, which is surrounded by a rainbow of white, orange, yellow and even green diamonds – reaching a mind-blowing 1,305 gems in total. The centre diamond is one of the rarest blue diamonds in the world, and is removable from the brooch and can be worn as a solo piece. It solidifies the nickname of Laurence Graff (founder of Graff Diamonds) as the “king of diamonds” and has become famous in the world of jewellery. No jewellery collection is complete without a statement brooch. If you love the opulence of the Peacock, take a look at our exclusive 18ct Gold Iolite and Diamond Snail Brooch for a rare addition to your collection. Wallis Simpson, Duchess of Windsor, was the wife of Edward, the Duke of Windsor, who abdicated from the British throne so the couple could be legally married. 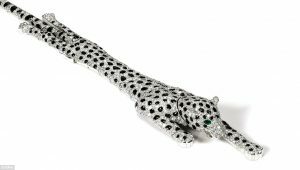 Throughout their relationship, Edward gifted Wallis with some of the most extravagant jewellery of the time, none more iconic than the most expensive bracelet ever sold – the Cartier Panther bracelet. In 2010, it was sold at auction alongside 20 other pieces owned by the Duke and Duchess, including a heart-shaped diamond, emerald and ruby brooch, and another Cartier diamond bracelet. It remains to this day the most expensive Cartier item ever sold at auction. No collection is complete without a statement bracelet like the beautiful Panther. 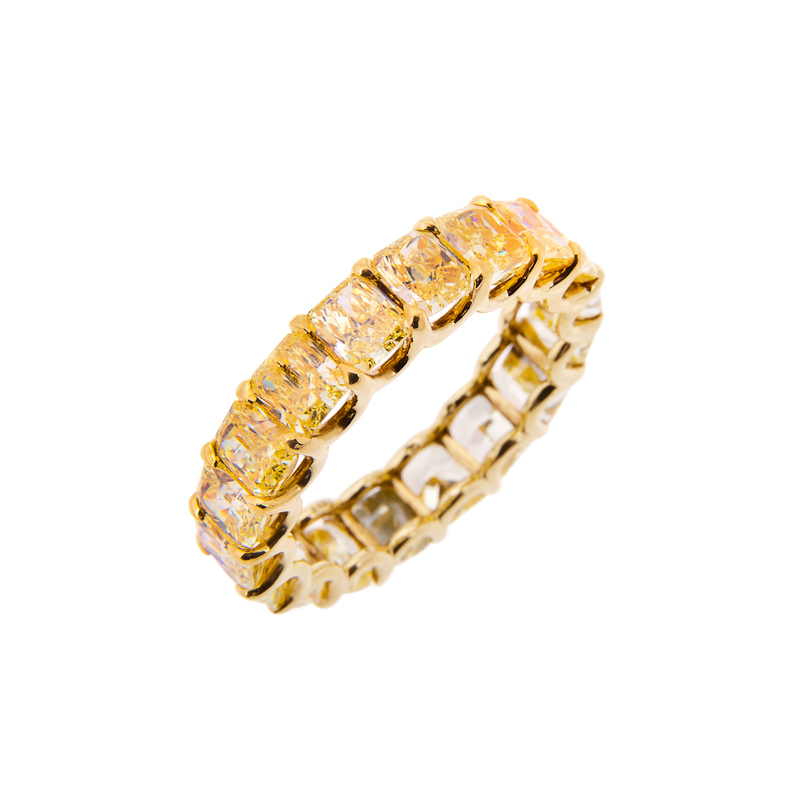 Our range of diamond bracelets are perfect for turning heads. 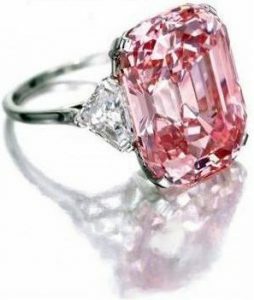 In 2010, Laurence Graff paid £29 million for one of the largest pink diamonds in the world and immediately named it “The Graff Pink”. The stone’s rare pink colour is thought to be caused by the stone absorbing light in an unusual way when it was being developed. The diamond is now set between two shield-shaped diamonds on a white ring and was previously the most expensive gem ever sold at auction until it was overtaken by the Blue Moon of Josephine in 2015. Diamond rings will last a lifetime, much like the Pink Graff Ring. 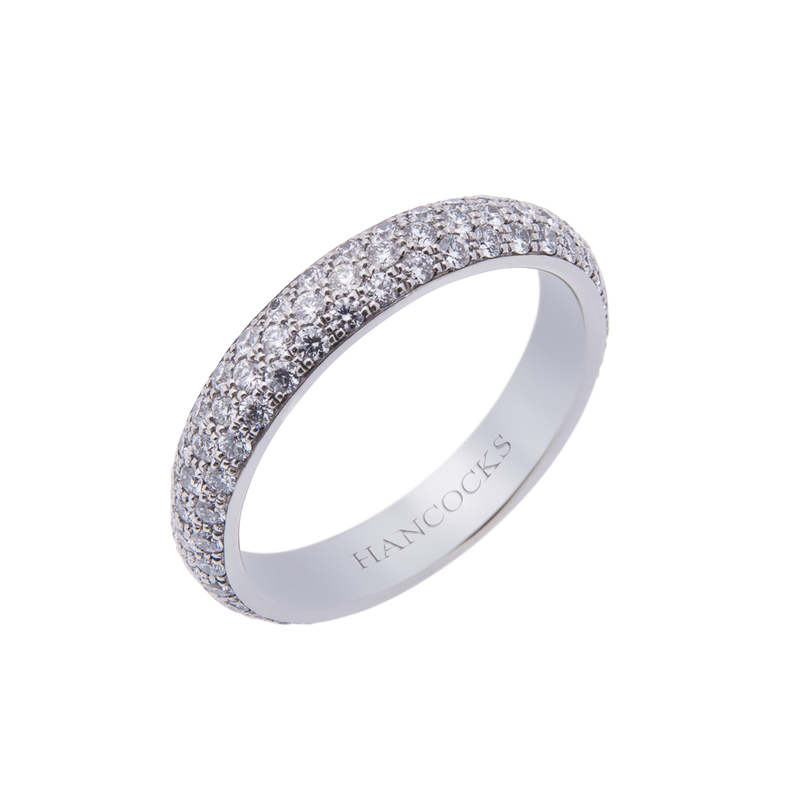 Add a new diamond ring to your collection today with our extensive range. 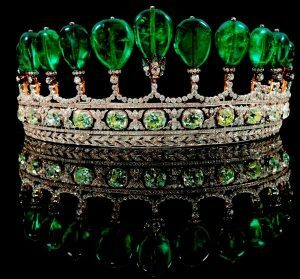 There are so many beautiful and amazing tiaras in the collections of royal families the world over, but none quite as rare and unique as the emerald and diamond tiara that once belonged to Princess Katharina Henckel von Donnersmarck. Commissioned by German prince Guido Henckel Von Donnnersmarck, the exquisite piece contains 11 extremely rare pear-shaped polished emeralds from Columbia totalling 500 carats, surrounded by countless clear diamonds. The tiara has been linked to the wife of Napoleon, Empress Eugenia, and remains one of the most famous tiaras to ever be auctioned. The tiara managed to sell for $12.7 million at the Sotheby’s auction house in Geneva in 2010 to a very lucky private buyer. In November 2015, Hong Kong billionaire Joseph Lau spent a record $48.4 million on a 12.03-carat blue diamond for his seven-year-old daughter, Josephine. 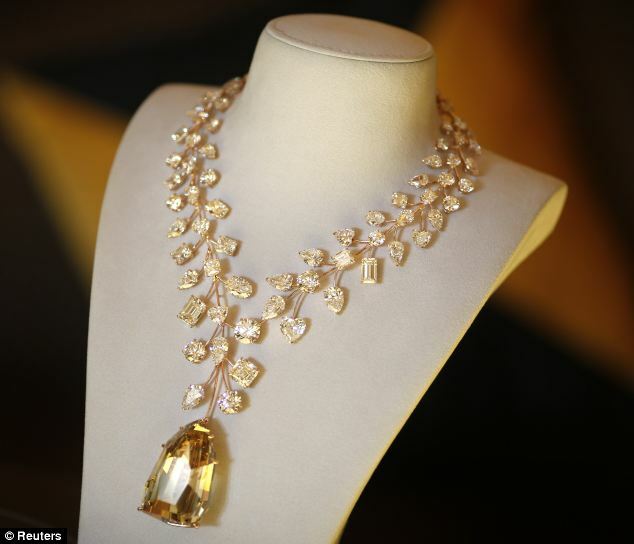 The sale broke several records and became the most expensive jewel ever sold at auction. The rock was renamed “Blue Moon Of Josephine” after purchase. 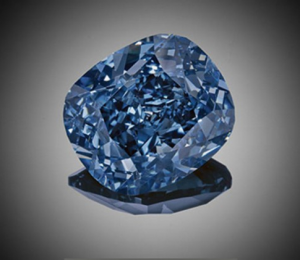 The diamond was discovered in South Africa in 2014 and was the largest cushion-shaped blue stone in the fancy vivid category to ever appear at auction. The Blue Moon may now be Josephine’s to keep, but why not treat your loved one to an unforgettable gift with our range of diamond jewellery? From earrings to pendants, there’s something for every taste and occasion.